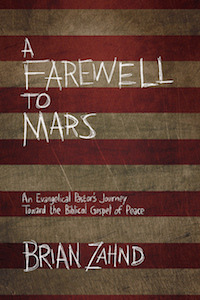 On Sunday, Brian Zahnd, lead pastor of Word of Life Church in St. Joseph, Missouri, released a new book entitled A Farewell to Mars: An Evangelical Pastor’s Journey Toward the Biblical Gospel of Peace. Zahnd has traveled a path of change across various theological and ecclesiological areas. And one is detailed in this book, noted in the subtitle – moving from adopting a view of the sword towards one of embracing the gospel of peace as seen in the cross. We know Jesus the Savior, but have we met Jesus, Prince of Peace? When did we accept vengeance as an acceptable part of the Christian life? How did violence and power seep into our understanding of faith and grace? For those troubled by this trend toward the sword, perhaps there is a better way. What if the message of Jesus differs radically differs from the drumbeats of war we hear all around us? Using his own journey from war crier to peacemaker and his in-depth study of peace in the scriptures, author and pastor Brian Zahnd reintroduces us to the gospel of Peace. Here’s the deal – you can purchase it for FREE today on Kindle or Kindle app. So take a minute, or 20 seconds, to purchase it right here. If you want a little more introduction into Brian Zahnd’s writings, check out his blog. This entry was tagged books, peace, war. Bookmark the permalink.